I wanted to put up this chart on my blog as inspiration for all of you who do not consider yourself in the top one hundredth of one percent richest Americans. 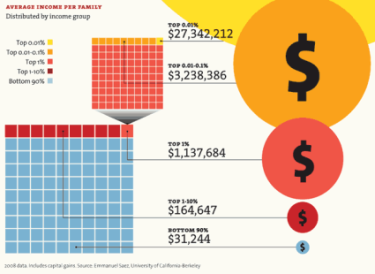 As you can see from the disparate numbers to the left, the bottom 90% of Americans pull in an average salary of approximately $31,000 compared to those at the top who are making $27,000,000 annually. For most of us (who aren't named Bill Gates, Henry Ford, or Thomas Edison), we will never have that killer business idea or once in a lifetime invention that changes the world. Instead, the only way we will ever be able to close the gap with those at the top, is through regular consistent investing. In the next post, I am going to look at the best ways to get started if you have no idea where to begin.